I'm a Murnau fan, but I have trouble recalling this one, famous as it is. 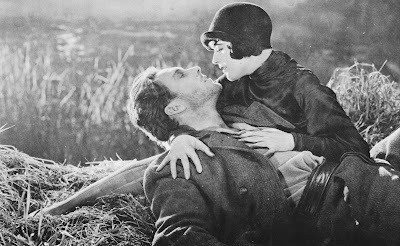 End of the silent era will always be City Lights (1931) for me. The highwater mark is harder - Potemkin? Earth? Clergyman and the Seashell? Un Chien Andalou? Point well taken, there were several great silents that came after this, but everything that came after Jazz Singer was in the twilight. The push really was on to incorporate sound more and more after this. Oh, this is just so great! You manage to be both professional and amusing, simply admirable. Interesting fact about the synchronized musical score - it always feels good to know that it's the original music playing along! How frustrated have you not felt while watching Chaplin silents and heard that gruesome new soundtracks, probably put together by a teenage on practical working experience that hasn't seen a film older than 1984. Sunrise is such a beautiful movie. The acting may look a bit "over-the-top", as silent actors were wont to do, but King Vidor was a master of tender storytelling. One of the great forgotten directors, who really belongs up there with the all-time greats. oops, I screwed up and credited King Vidor for Sunrise. My bad. All the good things I said about King and Sunrise are hereby transferred to Murnau, although I still think Vidor was an equal masterful storyteller.